The relative ease, convenience and reach facilitated by online channels for businesses has led to the development of a broad set of digital services. The accessibility of the Internet and the ability to commit fraud remotely creates an appetizing prospect for criminals. 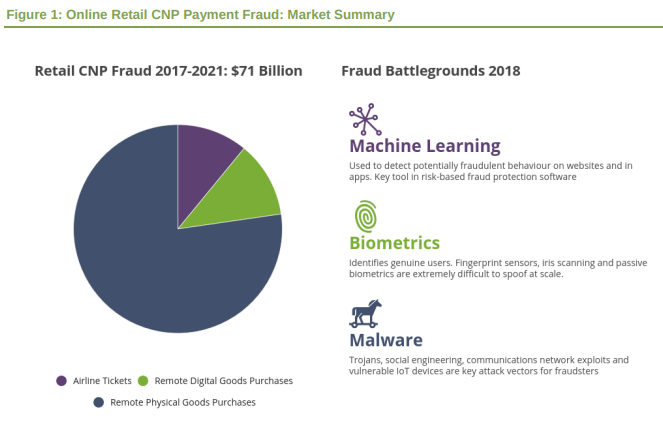 Meanwhile, the potential attack surface for miscreants is enormous; some 94 billion transactions were made for remote goods purchases in 2016, which is only a fraction of the total eCommerce landscape. A new market study from Juniper Research has found that spending on online fraud detection and prevention (FDP) solutions will reach $9.3 billion by 2022 -- that's an increase of 22 percent over this year’s anticipated spend. The research found that perceptions of high software costs, combined with relatively low awareness of effective solutions in the eCommerce space, were slowing service adoption. Nevertheless, it predicted that several factors would prove instrumental in driving the market forward. According to the latest global market study by Juniper Research, the growing threat of insecure IoT (Internet of Things) devices would be key in driving FDP spend. The evolution of IoT botnets from DDoS (Distributed Denial-of-Service) weapons aimed at fraud automation tools has influenced this trend, owing to a requirement for better customer verification tools. Meanwhile, Juniper predicted the launch of 3DS 2.0 (3-D Secure 2.0) would have a similar impact. It claimed 3DS 2.0 would both reduce fraud and result in fewer basket abandonment, if merchants invested in authentication solutions as part of their FDP strategy. Finally, it cited the upcoming PSD2 (revised payment services directive) and the move to open banking APIs in Europe, North America and Asia as a further driver. "APIs expose a set of business logic rules, which by their nature are susceptible to abuse," said Steffen Sorrell, senior analyst at Juniper Research. "This will drive banks and service providers to greater emphasis on protecting those APIs." Collectively, these regions will account for only 4 percent of global FDP spend in 2022. The research findings noted that stronger regulation to protect consumers as well as better consumer education in safer online practices were key issues to address.